The newest player to officially sign onto Bradley University’s volleyball roster is only 4-feet-6-inches tall, but 10-year-old Allie Salmon packs a lot of spirit and determination into her small body. The fifth-grader from Pekin, who battles a rare, potentially life-threatening immune dysfunction known as juvenile dermatomyositis (JDM), signed a letter of intent during a special ceremony recently at Bradley’s Renaissance Coliseum in Peoria. Allie was matched up with the volleyball team through a nonprofit organization called Team Impact that connects children facing serious and chronic illnesses with local college athletic teams to form lifelong bonds. 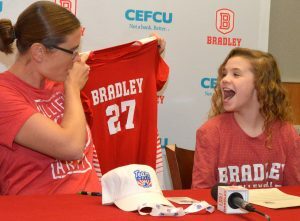 She grinned with surprised joy as Bradley volleyball coach Carol Price-Torok presented her with an official Bradley jersey sporting the number 27, the same number Allie wears when playing on her own volleyball and hockey teams. Allie’s family had previously provided the coach and team with special Bradley-red “Allie’s Army” T-shirts that they all wore at the signing. The Salmons designed and typically sell the shirts in green as a way to raise funds for Cure JM, a nonprofit organization focused on finding a cure for juvenile dermatomyositis and juvenile polymyositis. The team not only has adopted Allie but has also welcomed her family with open arms. most of the Bradley volleyball games with her. All but the youngest, including older brother A.J., 18, are hockey players. In addition to cheering on the Bradley team at games, Allie attends practices once a week at which the players sport their “Allie’s Army” shirts. Both Price-Torok and player Hannah Angeli, a junior from Minnesota, said they were surprised and delighted at the girl’s athleticism despite battling JDM. Allie was diagnosed with JDM in June 2016 after first showing symptoms of a rash, followed by muscle weakness. JDM is an inflammatory disease of the muscle, skin and blood vessels that affects only about three in one million children each year. Part of her treatment involves monthly infusions of intravenous immunoglobulin at St. Louis Children’s Hospital, which can cause painful side effects for up to a week after. Allie had been playing soccer, softball and hockey before being diagnosed but gave up soccer and softball because too much sun exposure can affect the disease. 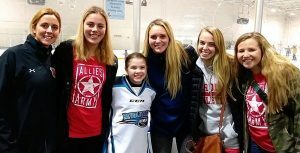 Coach Price-Torok said having Allie on the team is “almost like having a little sister.” In typical big sister fashion, several of the players turned out to watch Allie and her sister Avery play hockey recently. “I cannot even begin to tell you the ridiculous amount of happiness that brought to the girls, as well as the rest of us,” Corrie said. For more information about JDM, visit the website www.curejm.org.